A paper co-authored by Professors Martin Peckerar and Neil Goldsman has been published in the Royal Society of Chemistry journal, Energy & Environmental Science. The paper, titled A novel high energy density flexible galvanic cell, was co-authored by ECE alumni Zeynep Dilli, Mahsa Dornajafi, and Yves Ngu, as well as Robert B. Proctor, Benjamin J. Krupsaw and Daniel A. Lowy. Ultrathin galvanic cells, which can comply with a variety of form factors and electronic system packages, are of technological importance, as they show promise for flexible electronic systems. 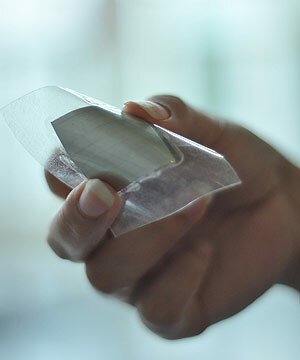 The paper describes a high energy density flexible galvanic cell, which is non-toxic and environmentally friendly. As the battery utilizes aqueous electrolytes, it is safe in operation, which enables its use in a number of settings and surroundings. The battery can be optimized for volume manufacture at low cost. Given that they function at much lower cell voltage than Li-ion batteries do, these cells can be recharged remotely, at a conveniently low voltage, by harvesting radio-frequency (RF) energy or microwaves, as well as other energy sources. Also, its cycle life of up to 400 charge–discharge cycles is very promising for use as a secondary battery. The researchers' technology was awarded the University of Maryland Invention of the Year prize, and took first place in the annual University of Maryland Business Plan Competition. For more information about the group's rechargeable, thin-film battery, visit www.flexelinc.com/. The Energy & Environmental Science journal publishes important, high-quality, agenda-setting research that is of significant general interest to the community-spanning readership. Energy & Environmental Science's first official Impact Factor was announced as 8.50, making it the #1 ranked journal in the field. To read the article in its entirety online, visit the Energy & Environmental Science website. RSC Chemistry World, "Power Sources Get Flexible."